Daniel tells the king, not only what he had dreamed, but what the strange dream meant. 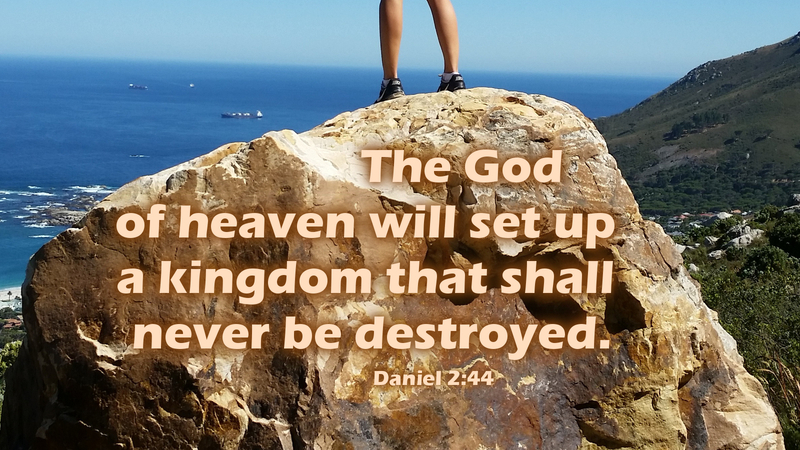 There would be four kingdoms, beginning with Nebuchadnezzar’s golden reign and ending with a divided kingdom that would be destroyed by another, a kingdom that have no end. In today’s Gospel reading, we fast-forward to the time of what is considered to be that of the last, mixed kingdom in Nebuchadnezzar’s dream, the fourth empire or beast: the Roman Empire (Dan 7:7–8, 19–27; Rev 12:3; 13:1; 17:12). It was thought that this empire would never end but “in the fifteenth year of the reign of Tiberius Caesar,” that beast was about to be dashed by a great “stone of stumbling,” the Rock who is Christ (1 Cor 10:4). His is that one enduring kingdom dreamed by Nebuchadnezzar, revealed by God, and prophesied by Daniel. The Lamb of God, the mighty Rock, has conquered all kingdoms, “for he is Lord of lords and King of kings” (Rev 17:14). Everyone—including mighty empires—who stumbles over that stone will be broken to pieces (Luke 20:18), but all who take their stand on him “are called and chosen and faithful” (Rev 17:14). Prayer: I take my stand on you, O Christ, my solid Rock. Amen.